The stars of new movie Twilight Saga: New Moon, Nikki Reed, Anna Kendrick , and Kellan Lutz all wear zorbitz jewelry. LOS ANGELES - Zorbitz (www.zorbitz.net), an accessory and gift company, has announced a hot trend worn by the stars of the new movie, the Twilight saga: New Moon. Actors Kellan Lutz ((Emmet Cullen) 90210, Generation Kill)), Nikki Reed (Rosalie Hale) The O.C., Thirteen) and Anna Kendrick ((Jessica Stanely) Rocket Science)) all wear Zorbitz jewelry and accessories, especially Zorbitz’ Lucky Karma Bracelets and Miracle Charm Necklaces. “I love this…. Congrats with such a great idea and I love the cause even more...,” said Kellan Lutz. Zorbitz makes a wide variety of products and each Twilight star has their favorite. 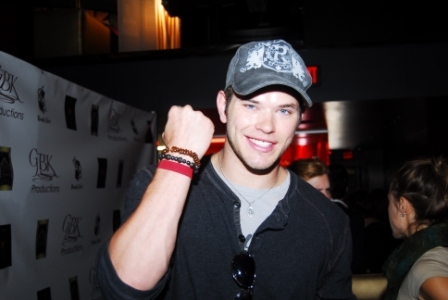 Kellan Lutz wears Coffee Bean Bracelets and Lucky Karma Bracelets. He even made a Miracle Charm necklace for his mom. Anna Kendrick wears a Miracle Charm necklace with a love and a mom charm. Nikki Reed wears Lucky Karma Bracelets and a Miracle Charm necklace made by her boyfriend. Twilight was one of the highest grossing movies of 2008, bringing in over 70 million dollars in the first weekend. For those not familiar with this pop cultural phenomenon, it is a romantic-fantasy film about a teenage girl who falls in love with a vampire. The series is based off the best-selling series of books by the same name written by Stephanie Meyer. The newest movie in the saga New Moon is scheduled to be released on November 20, 2009. Created in 2003, Zorbitz, Inc. designs, develops and produces a distinctive line of meaningful, beautiful accessories and luck charms for men and women at prices affordable to everyone. These bracelets are not only worn by the stars of Twilight, but have been worn by many other famous celebrities, including Ashlee Simpson, Heidi Klum, Paris Hilton, Lindsay Lohan, Courtney Cox, Freddie Prinze Jr. and many others. Zorbitz is a woman owned company and a portion of all sales are donated to charities worldwide. For more information, please go to zorbitz.net.